And yet so little to show for it so far. I haven’t mentioned it yet, but I’m going to be participating in the Vista Fiber Arts Fiesta Oct 12-13! I’m super excited since this will be my first fiber oriented fair! I’ve been dying up yarn as fast as I can manage, and then, a weird thing happened. I had a rush on the stock I had in my Etsy store! I’ve nearly sold out! While this is great, it means MORE DYING! All this dying has meant less knitting and a lot less blogging. I’m currently waiting on another shipment of blank yarn, so it’s time to catch up on the other stuff! 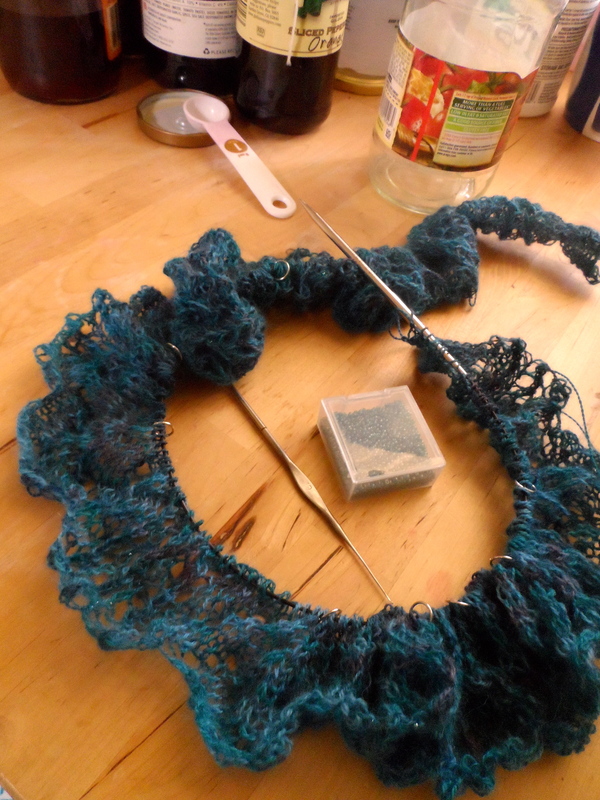 I started my Summer Blooms Shawl not to long ago. It’s plugging along at about 2 rows a day. This isn’t so bad considering each row is 417 stitches. I’m a little over half way through the lace portion and have started decreases. I’m loving this pattern so bad! 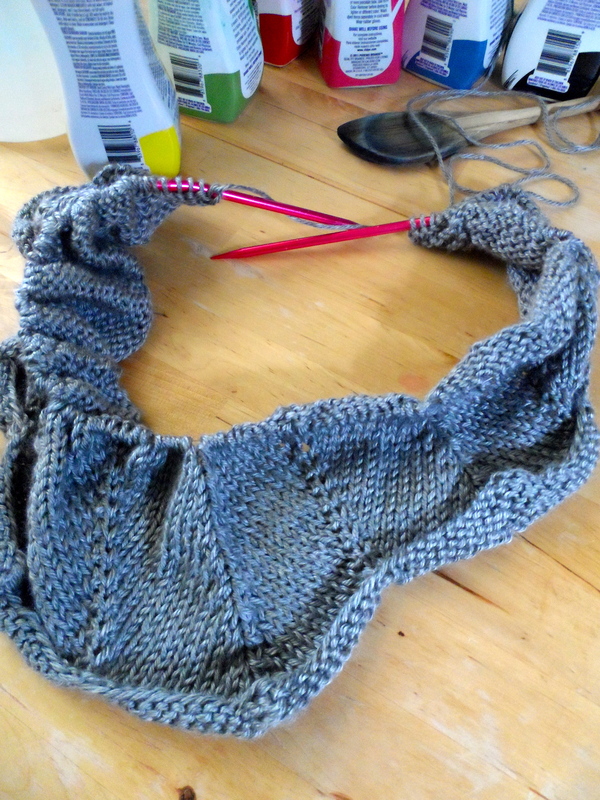 It’s the first time I’ve worked with beads in my knitting, and it’s way easier that you would think. The best part is that I get to use that sweet little antique crochet hook. It belonged to my husband’s great-grandmother! It’s the tiniest hook I’ve ever seen, and I can’t believe she could actually crochet with it! I’ve seen some of the lace she made with them (I have several of her old hooks) and someday I’ll have to post pictures of them. There’s also been some Christmas knitting going on (102 days left!). I started a nice chevron blanket. Still not sure exactly who will receive it come the holiday season, but at least I’m making progress on some gifts. I’ve stash busted some Caron Simply Soft for it, but knitting to much is somehow rubbing my fingers a little raw. Anyone else have that problem with acrylic? It’s never bothered me before. I’ve also started a scarf for my aunt. I’m not sure if I like it though. I had wanted to do this pattern out of something with mohair in it, but I didn’t have any in white, and my aunt keeps saying how hard it is to find a white scarf. This is some more acrylic from the stash. 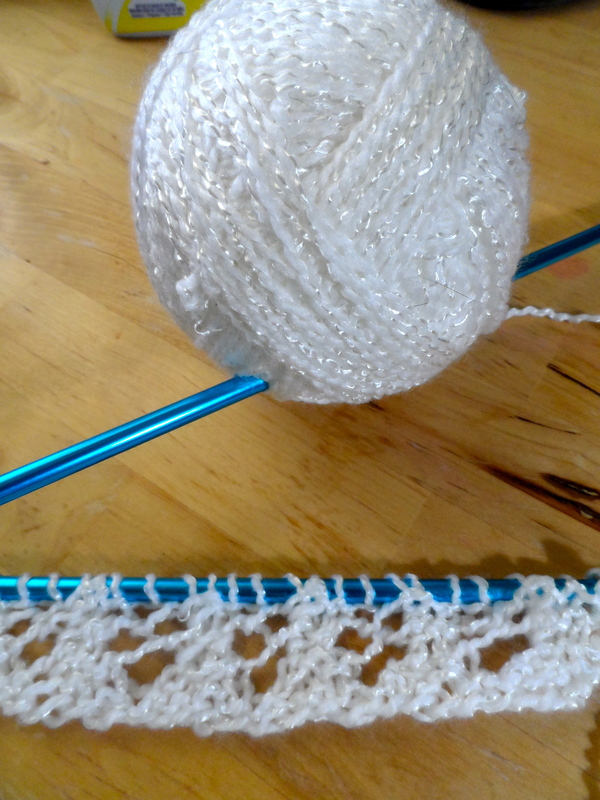 It has a sort of pearled strand running through it, and the yarn itself is kind of bumpy. Any of you have a better pattern you’d suggest?